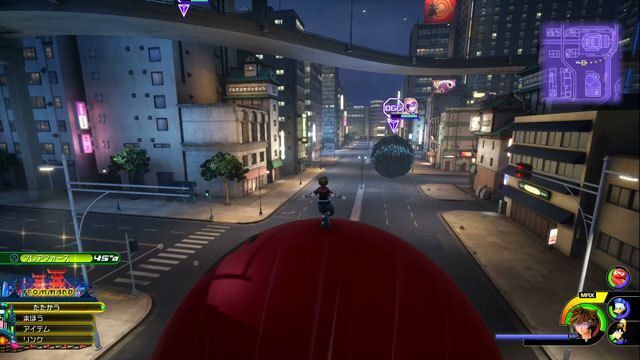 A complete walkthrough of San Fransokyo in Kingdom Hearts 3, including ally characters, obtainable equipment, and items. The only way to achieve a high score is to quickly pass through the rings while efficiently taking out enemies along the way. If you find yourself off course, look for the purple icon and follow the direction indicated by the arrow. If you ride on the back of the boss and attack its head, you can reliably deal damage and avoiding taking a share of your own. 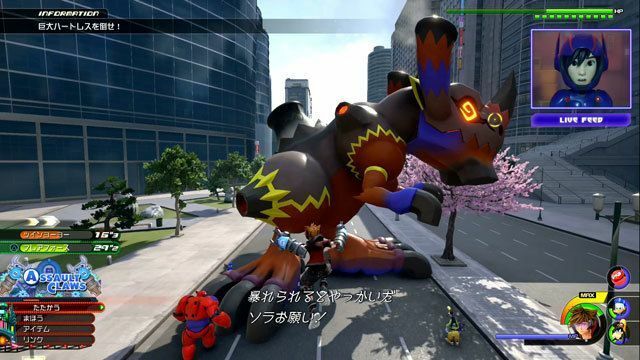 However, watch out for when the massive Heartless shoots fireballs from its back. From there, continuously attack its battery to stop it. When the battle moves to the roof of the building, shoot or attack its tail. Watch for when the tail summons lightning. This happens when it starts to elongate itself towards the boss’ head. Attack the “arms” of the mysterious cube creature clinging to the poles. Pursue the giant digital creature and attack it. 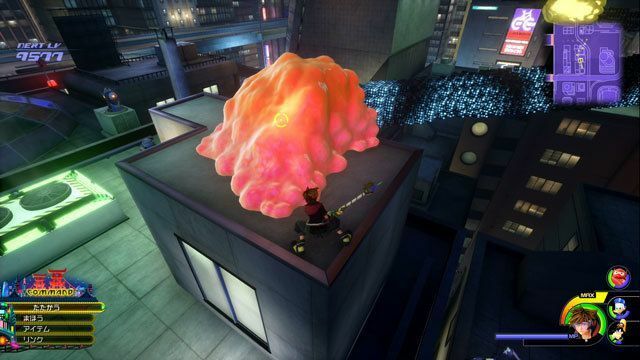 You can also use the giant crimson ball to make it easier for you to catch up and damage it. Attack the colored connections of the enemy with magic according to their color. Use the jumping platforms on the left and right to make an aerial attack on the enemy. You can only damage the Dark Cube when its core is exposed. This happens when it briefly assumes a heart form after performing a series of fist attacks. Focus on guarding and dodging its attacks when the core is hidden. The core will rise slowly from the ground after the boss performs its fist attacks. Pay attention to situation commands when they become available as well. Click here to see our more detailed Dark Cube Boss Guide. 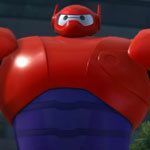 Pursue Dark Baymax while attacking it with the R2 button. Be careful of the mines and laser barricades deployed as you chase it across the city. The boss will briefly stop to aim its powerful laser attack at you so be prepared to barrel roll. For the next stage of the fight, strafe around the area to avoid its mines and projectiles and continue firing. 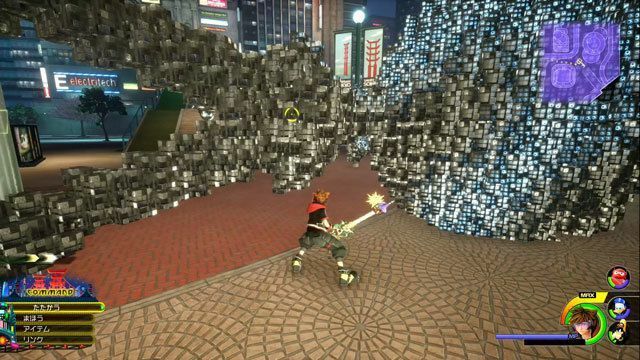 Note that you can throw the black cube mines it summons back at Dark Baymax to damage it. It will soon sprout wings to do a series of rush attacks that are very easy to evade. It will also summon multiple black mines. Continue to strafe while shooting and it will be defeated. 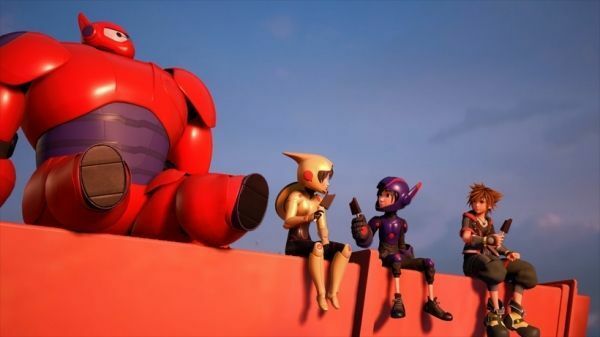 Sora, Donald, and Goofy explore the world of Big Hero 6 in a city called San Fransokyo. 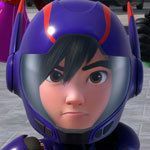 They meet Hiro, Go Go, and Baymax, protectors of the massive city who battle against the Heartless that have begun appearing. Riku is also spotted somewhere in the area wearing a black coat. The “attack the arms” method for the fire and ice guy was a bust. Had to do it 3 times before I realized I had to airstep each pole.